“Do you fancy taamiyah?” Dalia asked. 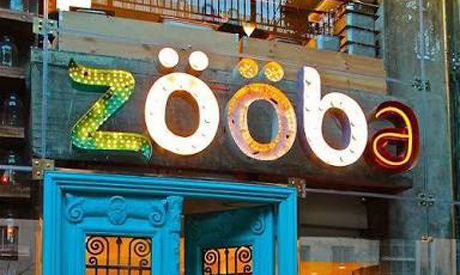 “Always do,” I said with a smile as we both looked at the pleasant terrace of Zooba overlooking Road 9 in Maadi that is increasingly looking like an open food court. It was a sunny winter day and we were both very hungry and the inviting "homegrown" label on the simple menu prompted a long order, even if the prices seemed to be slightly on the expensive end for what is otherwise street food: besara with coriander, labna with pickled lemon, labna with roasted red pepper, beetroot salad, classic and eggplant taamiyah (the latter only offered in sandwiches), and for Sherif, who was about to join us and would not have settled for such a relatively vegetarian meal, hawashim chicken liver and kofta (which are also only offered in sandwiches). 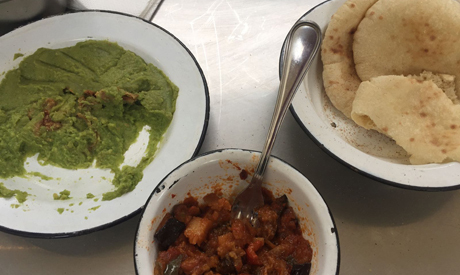 The homegrown, fresh and warm baladi bread (we went for the classic and dropped the unusual spinach or beetroot bread) was promptly served with cups of tea. Then came the waiter with a few jars. As she went to put the food in dishes, as we insisted, I told Dalia about the observations on Egyptian eating habits noted in the book Eirth El-Hekayah (The Heritage of Storytelling). In Nubia, if you are a stranger they tend to serve you your food in privacy, so you would not feel shy and eat enough. In Cairo, the host traditionally helps guests with every serving, to encourage them to eat enough. In the Delta, people tend to eat together from a few dishes. And in Siwa, the host tends to put more dishes than there are people around the table, to indicate willingness to receive more guests or family members. At that point, the food was appropriately scooped into dishes and served, along with the sandwiches. “These are really good sandwiches; really good, especially the hawashi. I mean, it lacks the essential street food quality of excessive spicing, but it is still good hawashi,” Sherif announced. Dalia was impressed to see the beetroot salad served with an orange-juice-based dressing. “Perfect; exactly the right mix; although not very common,” she announced. I agreed and added that the mix of ingredients is generally indicative of certain geographic zones. I told my friends about the observation that Nessma El-Goweili made in her book, Eirth El-Hekaya, on the fact that people in Siwa add fresh peppermint leaves to their soup and that people in Nubia make a breakfast of cooking vermicelli and milk with lots of sugar. “It is not a cooking book; it is the accounts of a young traveler who decided after the revolution to go ‘get lost a little’ around the four corners of the country, to explore the Egypt she did not know much about. So it is about the traditions of Egyptians — the way they live and so on,” I said to answer Sherif’s questions on the book. 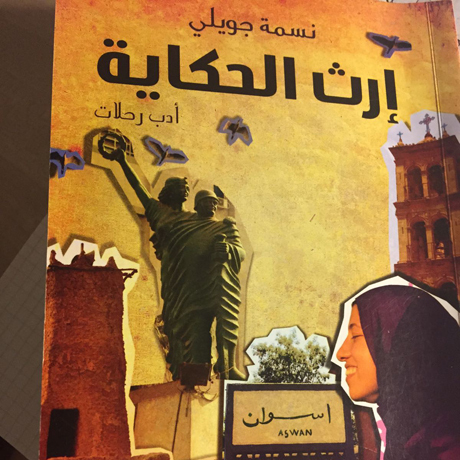 The book was written at the end of her excursion in 2013, and was published by Dar El-Shorouk in 2014. 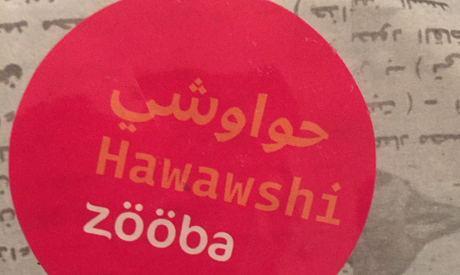 “This is not the typical taamiyah sandwich you would eat, even at the best chains of fuul and taamiyah,” Sherif remarked, stress his point that while Zooba is effectively offering a street food menu, it is not cooking according to street food norms. “It is closer to the kind of taamiyah my grandmother used to make us,” he added. Dalia agreed. “It is chic street food – but it is very good and very clean,” she noted. The food was good enough to the point that despite the considerably generous portions we had no leftovers and we decided to go for dessert. “Why on earth do they serve cream caramel? It is so out of place on this menu,” Dalia noted. We decided to opt for three types of sweet milk and rice pudding (original, with bananas, and with honey, nuts and fruits), and a mix of kanafa and basbousa. Those had to be served in the little jars, the waiter announced. We succumbed, to our displeasure. And we were not of a mind to rate the dessert half as highly as the main meal. “It is not bad. My mother’s rice pudding is 10 times better at least,” Sherif announced. “And of course, it does not stand a chance in comparison with the rice pudding served at any milk bar in Al-Hussein, which would also be half as expensive,” he added. Dalia and I decided that on the next visit to Zooba we should inspect the kushari, something that Sherif rejected categorically as we shared what he thought was a relatively expensive bill.